Last week I wrote about trading the trend using Opening Range Breakout System considering 60 min as the range. 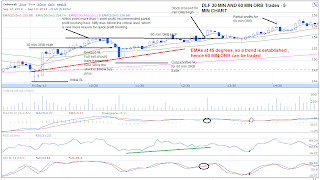 Today, I will take few examples from my own trades on Sep 13 to give more insights into different scenarios. Those who have not seen my earlier posts on these , please click on the below links to see the chapters from the Trading Course. 1. 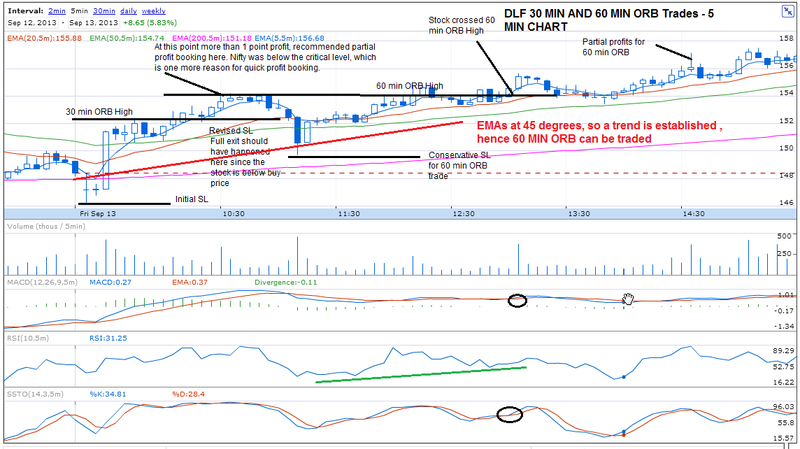 DLF - Where the stock reversed back into the opening range after the breakout. This example illustrates the importance of profit booking immediately after the breakout and keeping appropriate Stop losses. The same example shows how to trade a 60 min breakout. 2. 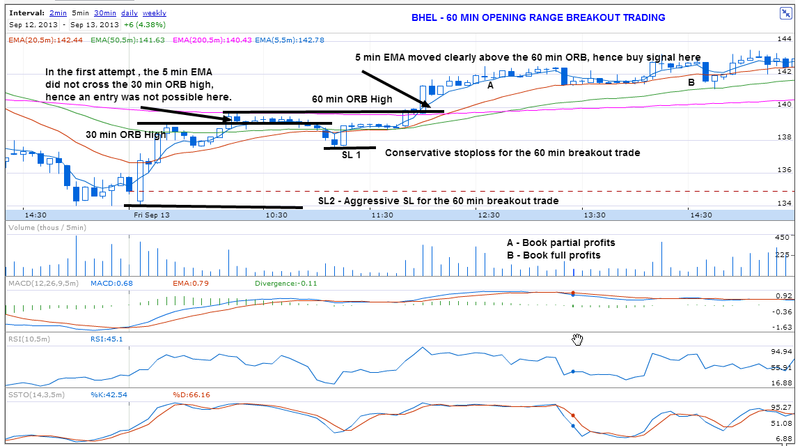 BHEL - Where the breakout happened after 60 min. This trade again illustrates the fact that all rules of opening range breakout trading has to be followed to enter into a trade. 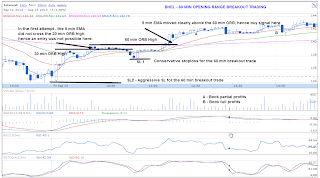 The stock gave a false 30 min breakout, since the 5 min EMA never crossed above the opening range, technically, it was not possible to enter the trade. However 60 min , gave a good breakout trade. 3. 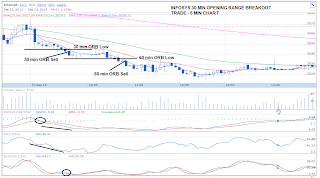 Infosys - Excellent example of opening range breakout sell after consolidation. I have wrote about consolidation and its importance several times in this blog. 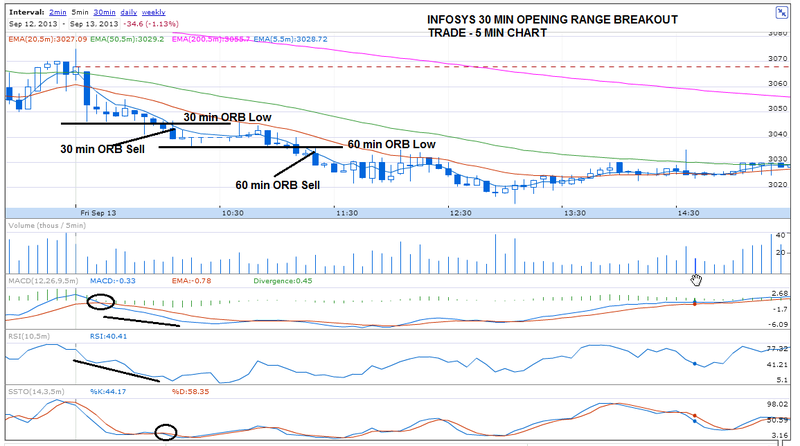 Infosys gave a good consolidation and breakdown for intraday trading on Sep 13. Please click on the links below to see my previous posts on consolidation. Will you trade spikes or consolidation ? Bharti Airtel - Consolidation example.